China may find Ireland’s experience in developing its digital enterprise sector relevant and useful. 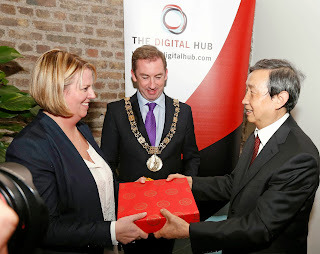 That’s according to Edel Flynn, Chief Executive Officer of the Digital Hub Development Agency, who was speaking today (29.10.13) during a visit by one of China’s top government officials to The Digital Hub. Mr. Ma Kai, Vice Premier of the People’s Republic of China, has responsibility for China’s industrial policy, investment, transport and human resources. He was visiting The Digital Hub as part of an official trip to Ireland, aimed at further enhancing the China-Ireland Strategic Partnership, and exploring the latest developments in digital technology, as well as bioprocessing and food. The Lord Mayor of Dublin, Oisín Quinn, officiated at today’s event and greeted Vice Premier Ma on his arrival to The Digital Hub. Speaking during the visit, Edel Flynn said: “Vice Premier Ma’s visit is the culmination of years of work between The Digital Hub and our contacts within both the Chinese government and private enterprise in China. Over the past 10 years, we have hosted a number of delegations from China who came to The Digital Hub to see what was being done here in terms of fostering digital enterprise, and how this could be replicated in their own country. “China’s tech sector is at a more nascent stage than Ireland’s, and the delegations that have visited The Digital Hub over the years have been particularly interested in how to develop a strong indigenous digital sector, whilst also attracting foreign direct investment and big-name, global digital brands. Since the 1970s, Ireland has built on its IT manufacturing base to become a world leader in digital and tech. “China is a priority market for Ireland in terms of bilateral trade, and I believe there is strong potential to increase trade in the area of digital products and services, in particular. The Digital Hub has built up a strong understanding of the Chinese market and excellent links with the Chinese government down through the years. As a result, we are well placed to advise Irish digital companies that are looking to break into – or expand their operations in – the Chinese market. And we are also well placed to advise Chinese enterprises looking to locate here. · PixelSoup, a digital media production company, whose education app ‘Symmetry School’ has been proving a hit in Asian markets. · Tempity, a cloud-based platform that allows recruitment agencies and talent managers to monitor temp availability in real-time and match temps with clients based on location and skills match. The company is one of the alumni of the Launchpad programme at the National Digital Research Centre (NDRC), which is based at The Digital Hub. · Lincor Solutions, a leading provider of bedside computing and multimedia solutions for hospitals and healthcare delivery organisations around the world. Lincor recently secured equity investment for international expansion and plans to add to its current installed customer base in China during 2014, with the support of local partners. Its primary focus will be to build on its existing customer-base and current sales opportunity pipeline in Guangzhou, Hong Kong, Shanghai and Beijing. During today’s visit, the Lord Mayor of Dublin, Oisín Quinn, stressed the close ties that exist between Ireland and China, and the potential for even greater links in the future. He said: “Beijing and Dublin are ‘sister cities’ since 2010, and there has been great progress in fostering links between our two capital cities in economic, educational, cultural and other areas. We look forward to developing stronger links with Beijing and China in the digital arena. Following his visit to The Digital Hub and his meeting with the Lord Mayor, Vice Premier Ma will hold meetings with the Taoiseach and the Tánaiste before returning to China tomorrow.